Long haul used to mean climbing into a 767 and monitoring the autopilot for 8 hours or more, ending up in some exotic locale like Florida, Goa, Cancun or the Maldives. Nowadays in a helicopter with maybe 2 hours endurance to min landing fuel, it is a multi leg trip with refuel stops. 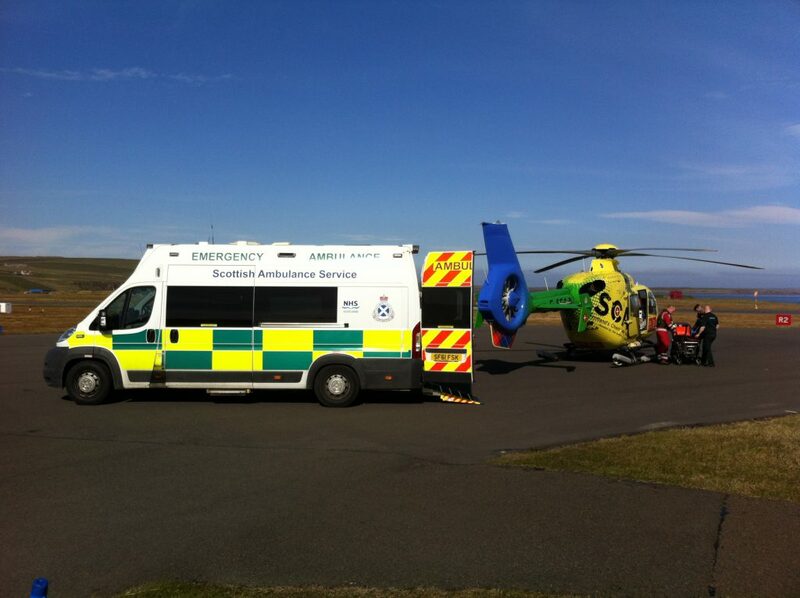 One recent job was an ambulance transfer from one of the outer islands in Orkney to the main airport in Kirkwall for onward road transport to hospital. 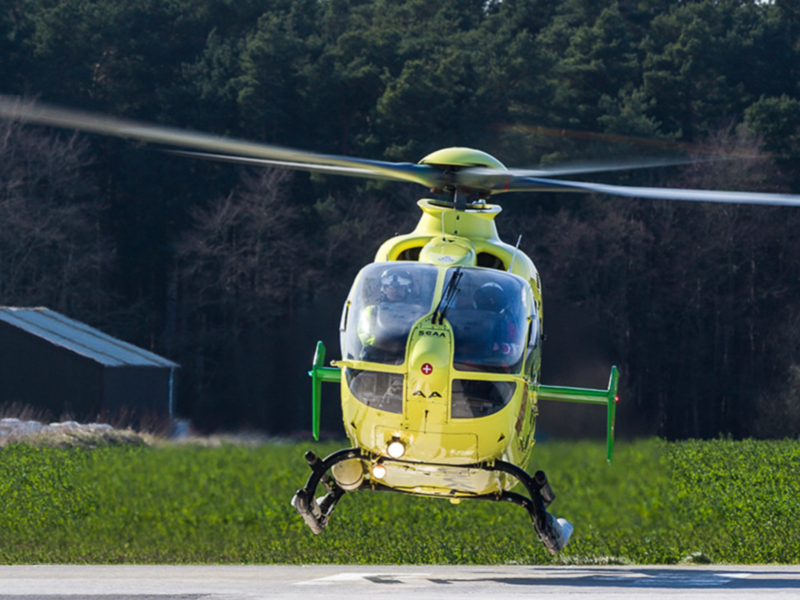 What could take all day for the patient was reduced to a 15 minute flight in the helicopter. 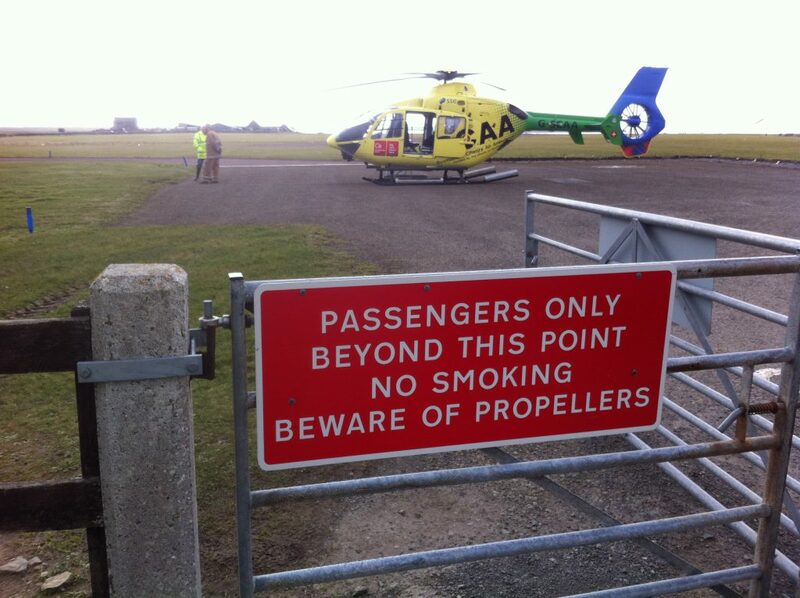 But first the helicopter had to get up to Orkney. 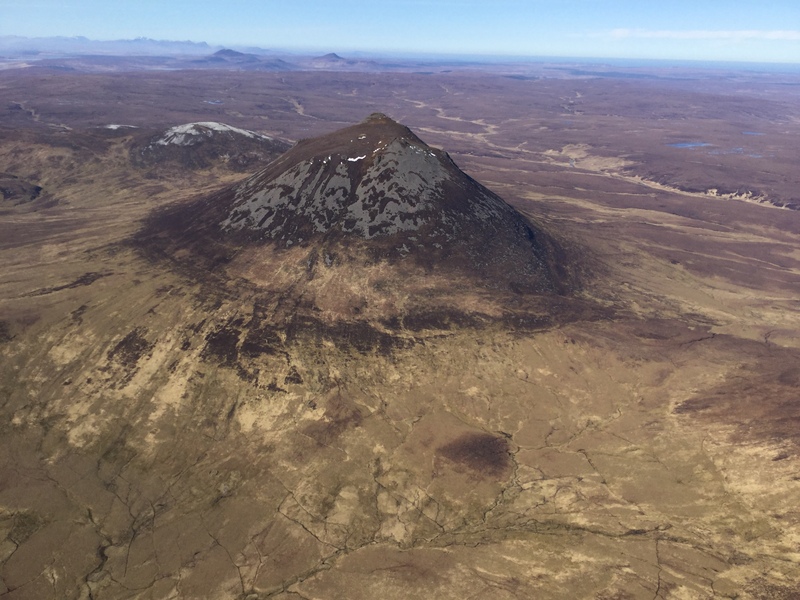 This is in the area covered by Helimed 2 based at Inverness, but on this occasion they were on another job elsewhere and unavailable. So we were called in to help. 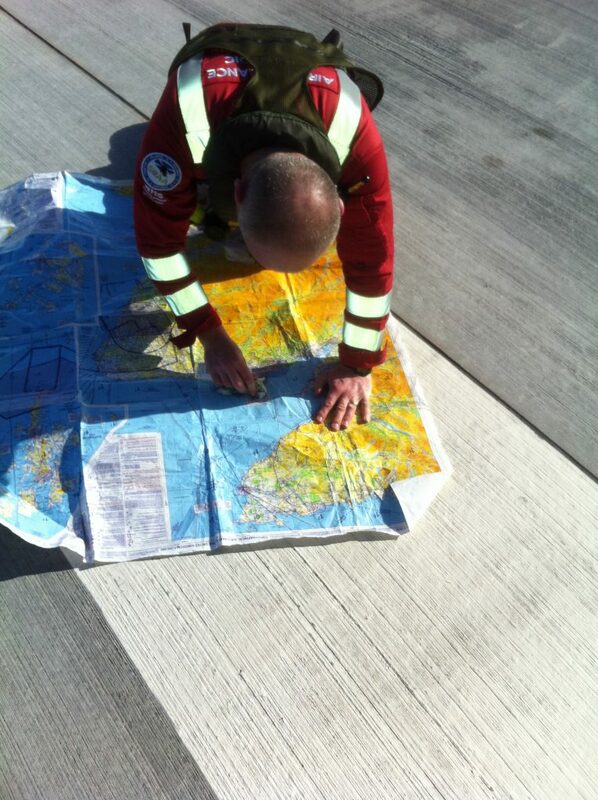 It was a lovely day and after a bit of planning, topping up the tanks and checking of weather we launched from Perth. 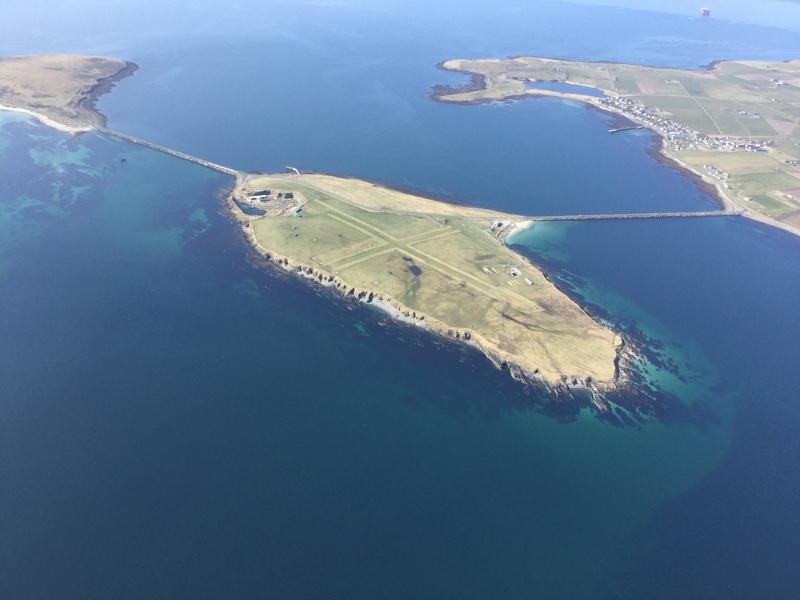 The first leg was planned from Perth to Wick for a refuel. 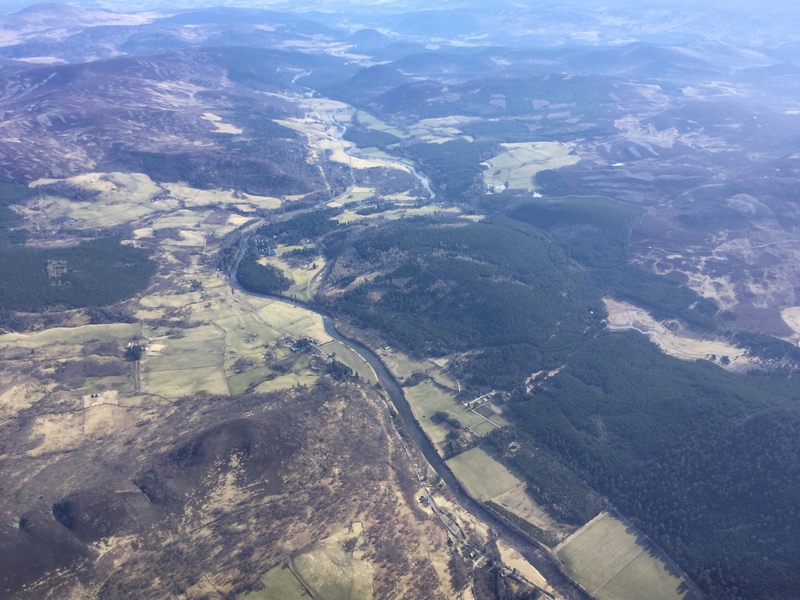 The track took us directly over Braemar, with views of Balmoral Castle on the right of the aircraft. It can just be made out on the wooded right bank of the river in the middle distance. 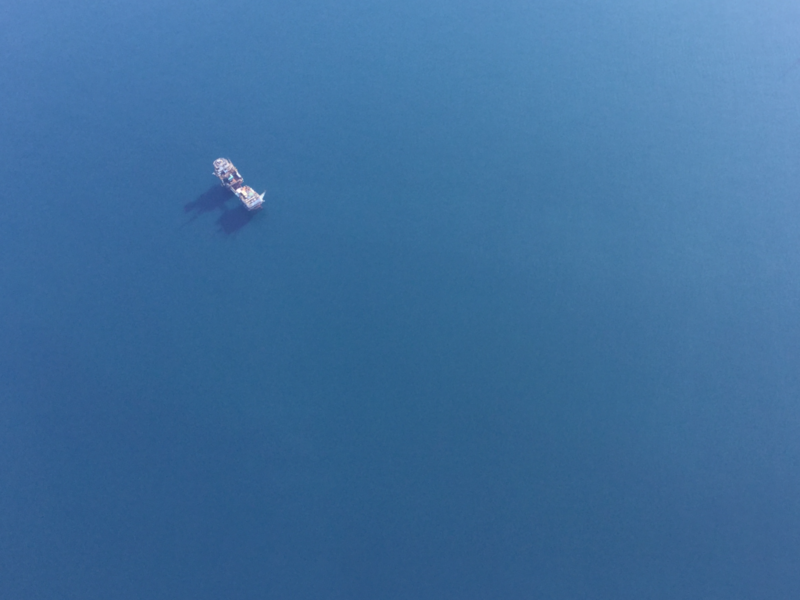 Apologies to HM The Queen, but from up here it looks tiny. Interestingly, the clearing in the woods to the right is where we once landed in the old Bolkow 105 on a job. 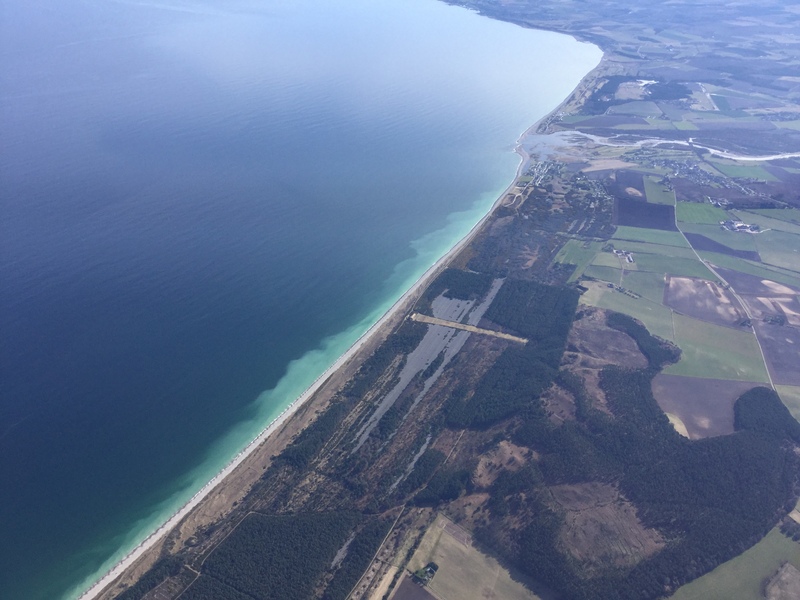 …and to the right, the mouth of the River Spey and a rifle range in the forest perpendicular to the shore. From Spey Bay it was overwater all the way to Wick. Halfway there is the small Beatrice Oil Field, which is nearing the end of its operational life. Construction of an 84 turbine deepwater offshore wind farm is due to start this year. On landing at Wick we refuelled to the maximum possible, which would give us enough to get up to Sanday and back to Kirkwall where we could top up again. The team at Far North Aviation always take good care of visitors, and today was no exception. As well as fuel we got coffee and a Kit Kat. 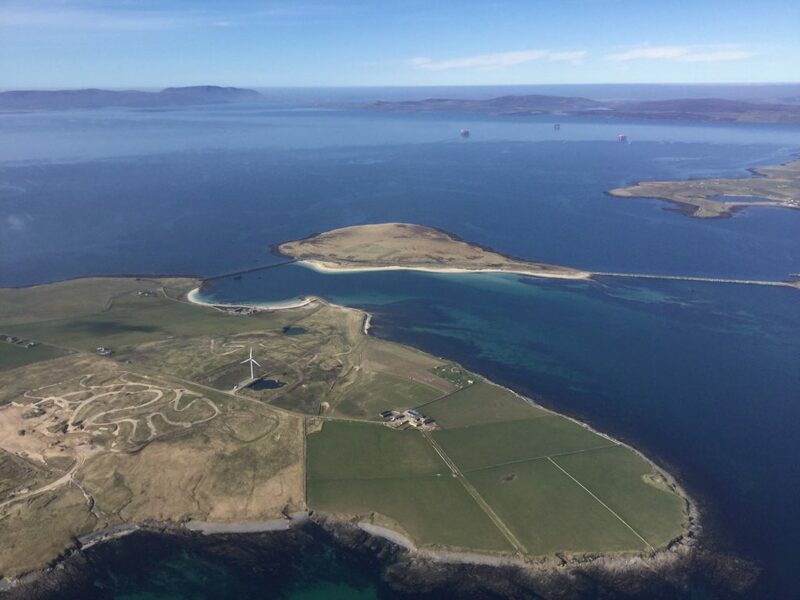 Airborne from Wick past John o’ Groats and over the Pentland Firth to Orkney. Here we are running up the western side of Scapa Flow, the great natural anchorage used by the Royal Navy in WW1 and WW2. Nowadays it is home to only a few mothballed drilling rigs. The causeways between the islands are known as the Churchill Barriers designed to close off access to the anchorage after Gunther Prien in U47 slipped through under the cover of darkness and sank HMS Royal Oak. As well as the war grave of the Royal Oak, the seabed of Scapa Flow is home to the remains of 52 ships of the German Grand Fleet, which were scuttled by their crews on the orders of Admiral Ludwig von Reuter on 21 June 1919. The ships had been interned since the end of the Great War. There is some talk of Kaiser Steel from salvaged ships going into spacecraft and sensitive medical instruments. Here’s Lamb Holm again. It’s the site of the Italian Chapel. Italian POWs housed on Orkney helped construct the causeways. Joining the islands “benefited the locals” and so the POW work was exempt under the Geneva Convention. Onwards to the north! Finally arriving at our destination Sanday, where our little helicopter took up the whole parking area. The airfield is served by BN2 Islander aircraft of Loganair. It would have been a bit crowded with two aircraft there. They are putting up a new airport building, once it’s complete they should keep the old one. Maybe “Terminal One” and “Terminal Two”? Or Domestic and International? 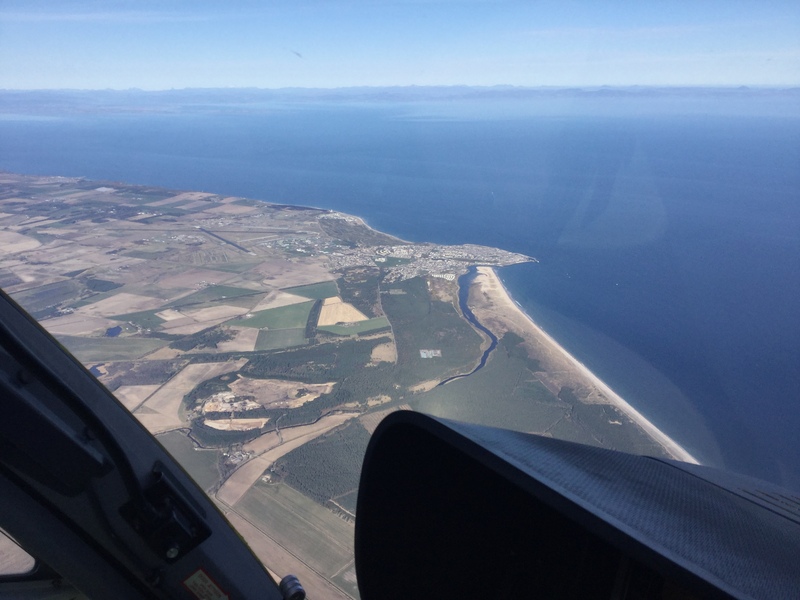 Now on the way home, we headed towards the Inverness Helimed base for another refuel and to pick up some medical supplies which would otherwise have come to us by courier. 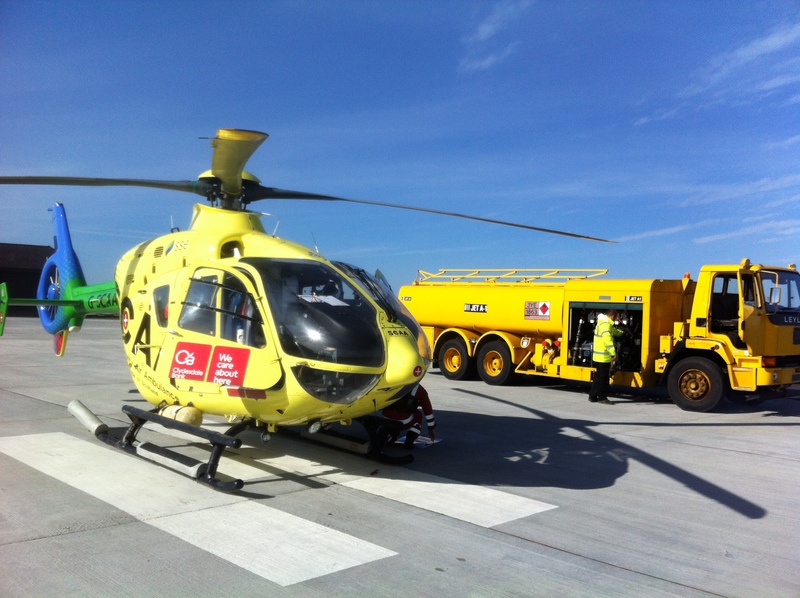 We had enough fuel to head straight home, but keeping the tanks topped up allows us to respond to any job that might come in while we’re on the way. 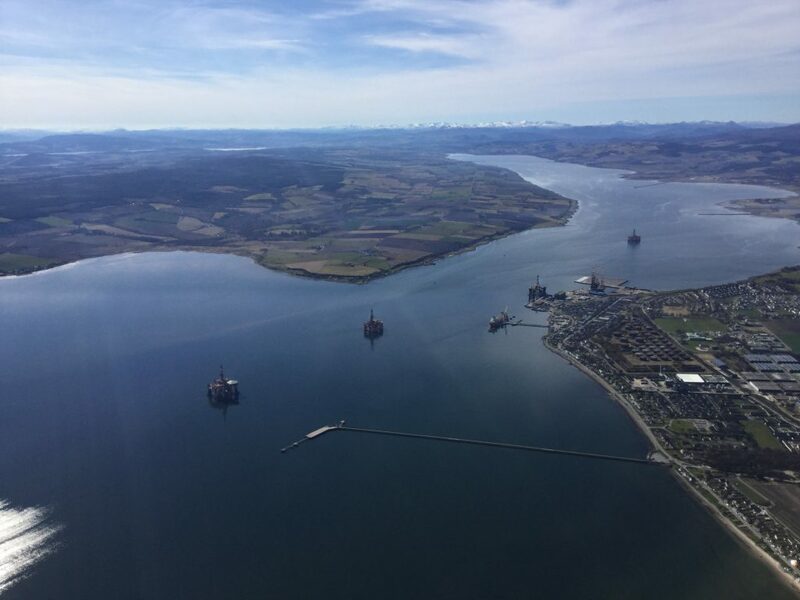 After “turning the corner” near Bonar Bridge (required because of the shape of the danger area for the bombing range at RAF Tain), we approached Invergordon where there were even more mothballed oil rigs. The rig fabrication yard at Nigg Bay has diversified into production of wind turbines over the past few years. Smart move. 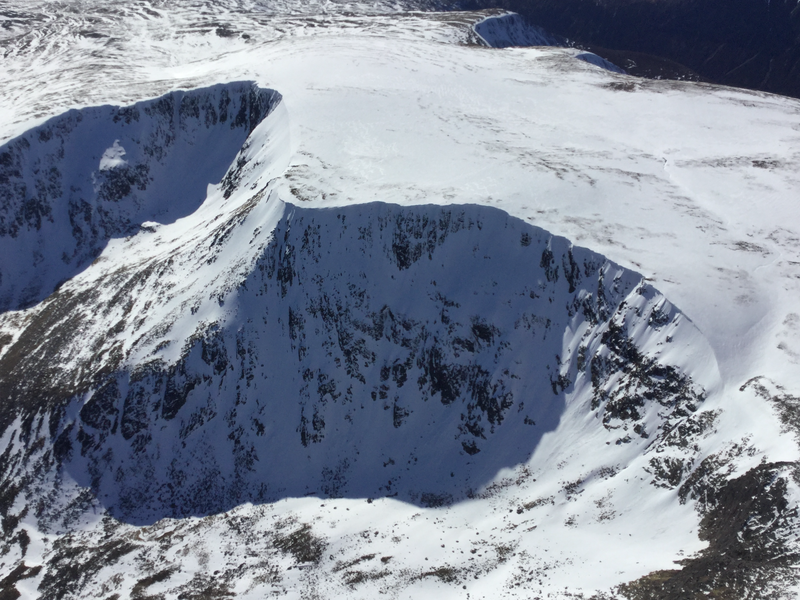 After the stop in Inverness and southbound over the Cairngorms, some were still snow covered. A couple of the ski runs at Aviemore looked like they could be open, white strips on the side of the mountain. It certainly hasn’t been a very good season for our local ski centre at Glenshee, perhaps Aviemore fared better. I used to buy a season ticket for Glenshee, you had to do 16 days or more to make it worthwhile. I don’t think they had that many days open this year.